Dual cab utes are a true Aussie favourite. And for good reason. When you picture a dual cab ute, a few things immediately spring to mind: rugged, reliable, powerful, refined, and, above all else, a real workhorse. These days, the very best dual cab utes include all of these features that we have come to expect, while also adding some well-deserved touches of class and style. This means that with so many high-quality dual cab utes to choose from in Australia, there’s likely to be one that suits your requirements. While the term ‘best’ can mean different things to different car buyers, check out our picks for the best used dual cab utes for families in Australia. Given the wealth of options out there, there are plenty of good quality second-hand dual cab utes to choose from. Of course, depending on your specific needs, you’ll have to weigh up a few factors when selecting the right dual cab ute for you, such as storage space, power, fuel economy, safety, reliability, and more. When it comes to dual cab utes, the Ford Ranger is in a class of its own, which is saying a lot, given the stiff competition it faces. Combining good looks, a great driving experience, and an impressive set of features, it’s easy to see why we chose the Ford Ranger as the best used dual cab utes for families in Australia. Some of the Ranger’s more flashy features include adaptive cruise control, lane departure warning, and lane-keep assist. Add to this an insanely smooth driving experience no matter the terrain, plus a well-designed cabin featuring a state of the art infotainment system, and it’s no surprise that the Ford Ranger is one of Australia’s best and most popular dual cab utes. If you like your dual cab utes to be roomy, no nonsense, and powerful, then look no further than the Volkswagen Amarok. First things first, the Amarok offers the biggest tray among its close competitors, which is a huge plus for anyone who regularly hauls large amounts of cargo. Better yet, the interior is still super spacious even with the larger tray, affording passengers plenty of head and leg room. On-road, the Amarok delivers an extremely comfortable ride, while still packing a good amount of power under the hood. The Amarok also comes with permanent all-wheel drive and an automatic gearbox with 8 ratios, which is again the most among its close competitors. Clearly, the Amarok leaves no stone unturned in its pursuit of excellence. Now into its eighth-generation, the Toyota HiLux has developed a well-earned reputation as one of Australia’s toughest and most reliable dual cab utes. How has it earned this reputation? Well, let’s start with the obvious. 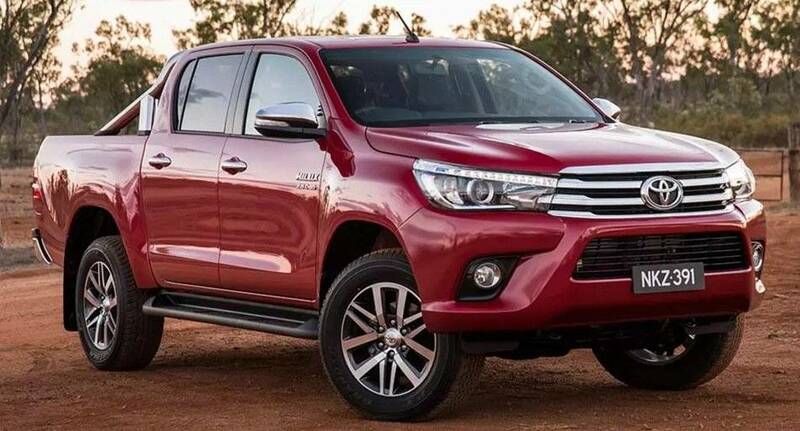 The HiLux blends a comfortable suspension setup with a standout, refined 2.8L engine that never feels overwhelmed, no matter what you throw at it. Elsewhere, the HiLux also offers precise steering, as well as a sleek interior that truly has all the trimmings, plus an excellent safety record, highlighted by ISOFIX anchor points. Pair this with an easy-to-use touchscreen entertainment system and you get a fantastically well-rounded dual cab ute. At first glance, the Nissan Navara promises a lot. Luckily, the Navara combines style with substance, meaning it easily lives up to that promise. Unlike many of its competitors, the Nissan Navara features a coil spring rear, which is sure to be a nice bonus for buyers who spend a lot of time behind the wheel. This is especially noticeable if you take the Navara off-road, where its suspension is miles ahead of most of its competition. Other standout features include the Navara’s rugged yet stylish exterior and equally well-designed interior, highlighted by heaps of storage space. On the road, the Navara combines a power-packed engine with sharp steering, making for a riveting driving experience. This performance doesn’t come at the expense of efficiency either, as the Nissan Navara offers class-leading fuel economy. In other words, the Nissan Navara has everything that a solid, reliable dual cab ute should! A workhorse in every sense, what the Mitsubishi Triton lacks in flash it makes up for in reliability. At first, you might suspect that the Triton’s quiet cabin is the result of an underpowered engine. But don’t be fooled, as the Triton offers the best of both worlds: a refined, quiet, ride and a powerful, hard-working engine. Slip from behind the wheel into the back seat and you’ll discover there’s plenty of room, making the Triton an ideal option for taller passengers. In terms of safety, the Triton also excels, coming equipped with active stability and traction control, and earning itself a five star ANCAP safety rating. Overall, the Triton faces any challenge with ease, both on and off road – an impressive feat for an impressive dual cab ute.